If you had a really important message to get across to your customers, how would you do it? Email…? Possibly, though chances are the recipient may not get it. Will they be hooked by the subject line, will its content be viewed as spammy or intrusive. Is it the wrong ‘time’, do they have 4G connectivity to click through, are they abroad, will they unsubscribe and most importantly when did you last opt this subject in? Sheesh, it’s kind of hard to predict campaign success based on such variables. Maybe you can send them an SMS…? Actually, same rules as above apply, but potentially more intrusive. Is your message really so important that you want to risk that mass unsubscribes? You could call them and tell them the news on the Phone? Undeniably it’s a great contact medium, but it takes resource and possibly a call centre depending on how big your audience base is. Sounds expensive? If you’re feeling flush, what about throwing more at PPC, at around 80p+ per anonymous sponsored click, with around a 20% goal-conversion, you’ll need to allocate a big chunk of your marketing budget, with limited contact. 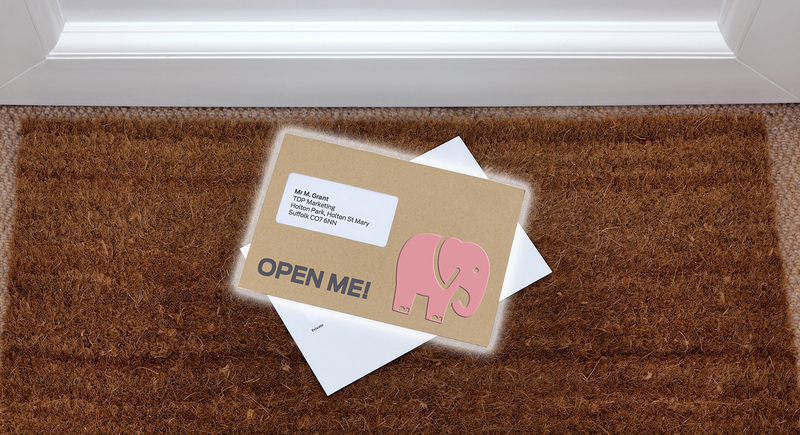 But there’s an Elephant on your doormat… Direct Mail allows you to work with a medium that’s currently unique in terms of penetration and original in today’s fast paced digital world. DM can help a campaign remain secure and private until it is mailed out (as it is not open to online exposure). Your competitor will not know about your campaign or promotion until it has been delivered. A recent report by The Royal Mail, highlighted the effectiveness of direct mail with some 48% of UK adults having taken an action in the last 12 months as a result of a mailing and a whopping 30% having bought something. How many pieces of mail do you receive daily, one, three? There’s not nearly as much competition vying for your attention in your letterbox as they are your inbox. PECR does not cover marketing by mail, but organisations sending marketing mail to named individuals must comply with the DPA. If an organisation knows the name of the person it is mailing, it cannot avoid DPA obligations by simply addressing the mail to ‘the occupier’, as it is still technically ‘processing’ that individual’s personal data behind the scenes. If an organisation is sending mailshots to every address in an area and does not know the identity of the people at those addresses, it is not processing personal data for direct marketing, and if your business is servicing users around a specific location this can be great for complete local penetration. Unlike email and text messaging, you don’t need to be concerned by breaching PECR related marketing regulations. This means that, even if a customer unsubscribes from your email list, as long as they’re not on the MPS, you can communicate with them freely and you can still reach them with direct mail. Ahead of the GDPR, this is the only real, viable route to re-opting in your lapsed customer base. DM doesn’t get caught in a spam filter nor does it carry a virus. It also remains effective long after it hits the mat, how many emails have you sent that have been pinned to someone’s fridge or propped on a mantelpiece? You don’t get that kind of staying power or attention with digital or email. If you send an email to someone who’s no longer there, it bounces, if you send a postcard, the new person in that job or address sees it—and you’ve just introduced yourself as a supplier. TDP Marketing research shows that business users sent or received 120 emails per day in 2016, this is expected to rise to 140+ by next year. The overwhelming volume of email received at work is a huge hurdle for legitimate email marketers. It’s hard to separate the junk from the legitimate email. As a result, a huge percentage of email sent to businesses remains unread. Businesses don’t receive nearly as much marketing mail as they did a decade ago, that’s a real opportunity. B2B decision-makers trust direct mail more than email, especially for high value products and services. Mailers can also include a wide variety of trust-building content not possible (or reasonable) to include in email. Yes, you can provide links, but with direct mail, you get that content in front of them in a tangible way right out of the gate and it can reach high-level decision-makers that email just can’t. If you want to stand out to your prospects, you have to do something different than what your competitors are doing. Everyone can send an email, but direct mail is unique and often to younger marketing professionals and consumers, it’s just not a medium they’re used to. The message here is not counter-productive to the full marketing-mix, quite the opposite. Marketing research shows that direct mail connects with customers on a deeper emotional level and provides a much higher response rate – you might be surprised that we can deliver your message for a third of the cost of serving a single PPC advert. We’re not advocating abandoning your digital strategy, but brands need to reach out to prospects and customers across multiple channels and the beauty of direct mail is that it integrates seamlessly with them. Triggered email, mobile, social and digital channels can all drive engagement and results, but nothing connects like an elephant on your doorstep.